Good evening and welcome to the 1st Eurovision Treat Petite contest round-up. Bonsoir et bienvenue au 1er Eurovision Traiter Petite concours rafle . First up we had Ros, The More Than Occasional Baker make us a lovely savoury Treat Petite, from our very own United Kingdom – Mini Pork Pies stuffed with quail eggs. They look as if they would be perfect for a picnic and Ros said they were much harder to make than they look. Next we had laura from I’d Much Rather Bake Than representing the Netherlands with her Speculaas Spiced Cookies. I have used speculaas spice myself before and I can tell you it is delicious. All warm and aromatic. 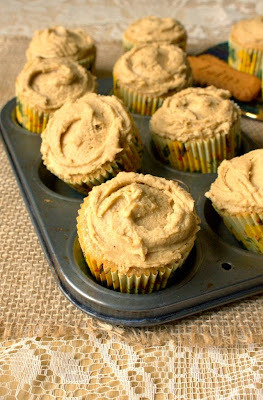 The cupcakes have speculaas both in the cake mix and in the frosting so it’s a double whammy. Laura is about to sit her exams I wish her good luck. Angela at Garden Tea Cakes and Me, made Black Forest Chocolate Cupcakes. 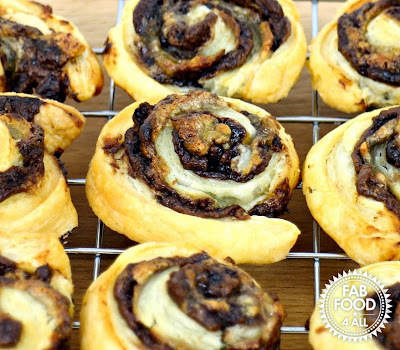 She uses a chocolate fairy cake mix to make these beauties then topped them with a vanilla buttercream and filled them with Damson jam. Black Forest of course represents Germany. Next we have a string of French entries. Lucy the Baking Queen made her first attempt at choux buns – which look to me as if they are a success! She ran out of time so didn’t add crème patissiere, but used a combination of whipped cream and lemon curd. These look fab and any French patisserie would be proud to have them in the window. 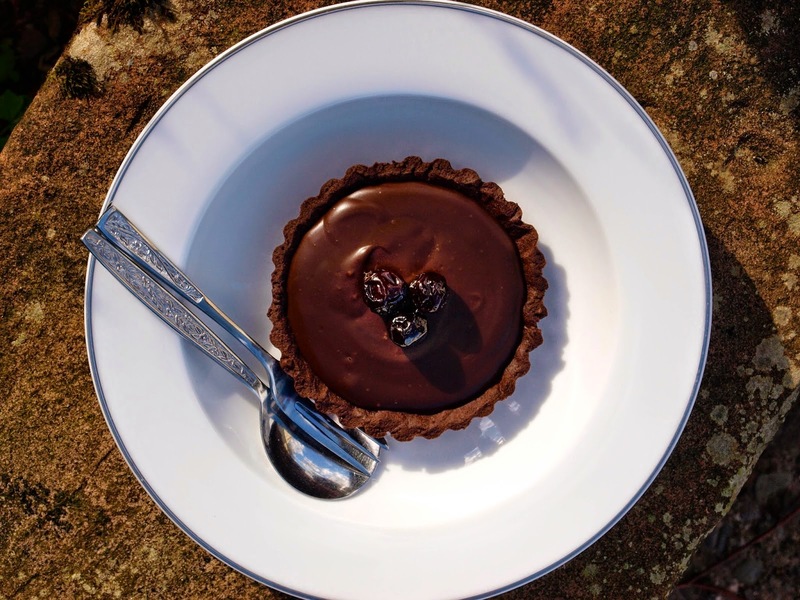 Next, my friend Janice from the Farmersgirl Kitchen made Double Chocolate Tarts or Tartlettes au Chocolat. 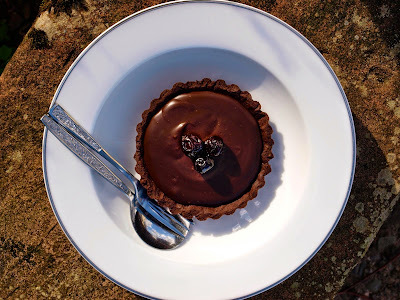 These impressive chocolated based amd topped tarts are from a book Janice reviewed entitled ‘Teatime in Paris’ by Jill Colonna. 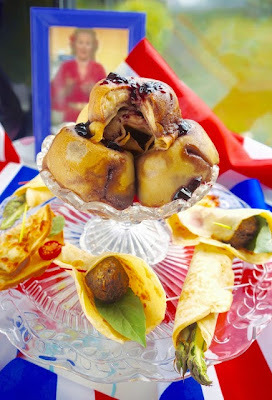 These look so decadent and are perfect for a French Treat Petite Eurovision entry. Kerene, The Dream Baker, made Chocolate Cream Puffs for her French entry. 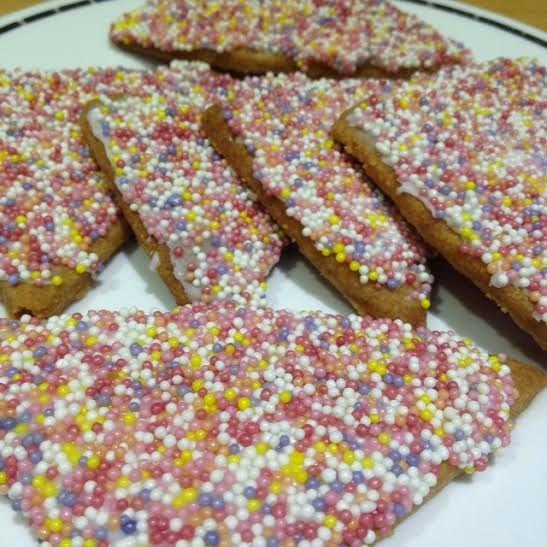 She used a recipe, she had used previously for chocolate eclairs. These are also known as profiteroles and look exceedingly lush! Claire, the Foodie Quine, a fellow North of Scotland food blogger, represents Ireland in the Eurovision with her Baileys, Pistachio and Cranberry Fudge. 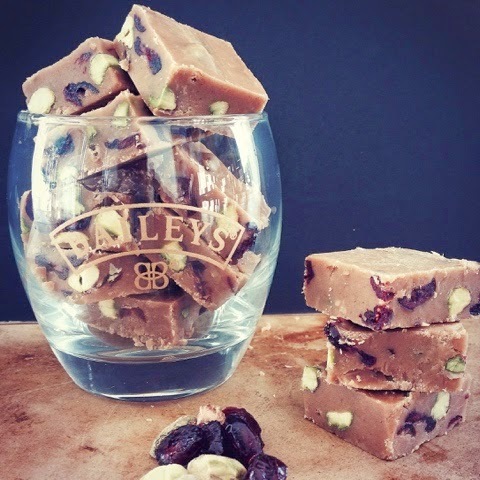 How good does Bailey’s sound in fudge?! I’m sold. Dom at Belleau Kitchen has entered Sticky Toffee Pudding Cake Fingers and has provided a range of countries that these could represent as they contain dates, which are grown in Greece, Turkey and Israel. These could even represent the UK as Sticky Toffee Pudding is very British. Dom cut his cake into fingers (making it suitable for Treat Petite) and served the fingers with a toffee dipping sauce. Genius! 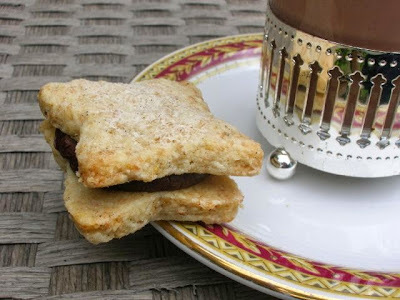 Choclette over at Tin and Thyme entered her vanilla chardonnay biscuits sandwiched with vanilla chocolate ganache. Choclette says the ganache is French, hence they represent France. I also love the fact they contain chardonnay – perfect for a Eurovision party!! 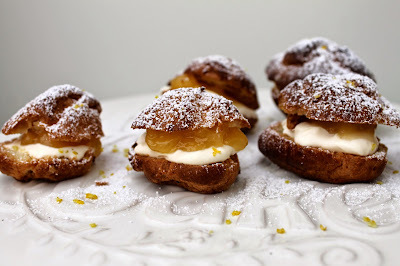 My entry was next, and I represented Italy – with Pistachio and Limoncello cookies. These are apparently a Southern Italian tradition. These are piped into the shape of a ring and I called them the Ultimate Party Ring! Leia at Lemon & Lime Thyme is from Austria originally and knew she had to enter something from her homeland. 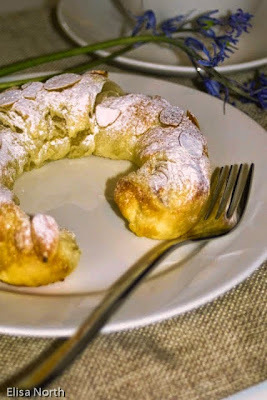 She made very tempting looking almond-marzipan kepferl. These are pastry crescents which were the forerunner to the croissant. 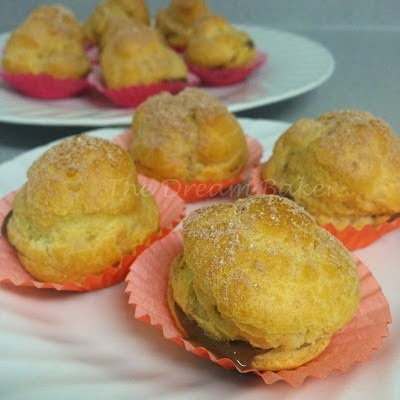 Filled with various different ingredients, Leia went for almond and marzipan for hers. This would be smashing with a cuppa. Angela at Patisserie Makes Perfect went for a French inspired entry with her Mille-Feuille. A delectable layering of puff-pastry she made with French butter. 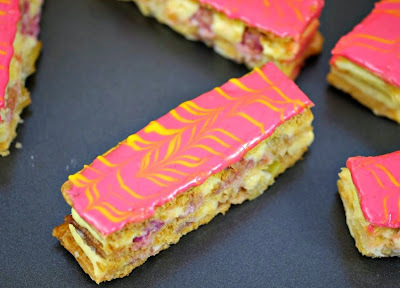 For her filling she went alternative and made a rhubarb and custard filling. The icing on top of these is something to behold and is as camp as a Eurovision party! Kate the Gluten-Free Alchemist flew the flag for the UK and Spain. She made ‘posh’Jaffa Cakes – Jaffa oranges are from Spain and Jaffa Cakes are inherently British – so take your pick. 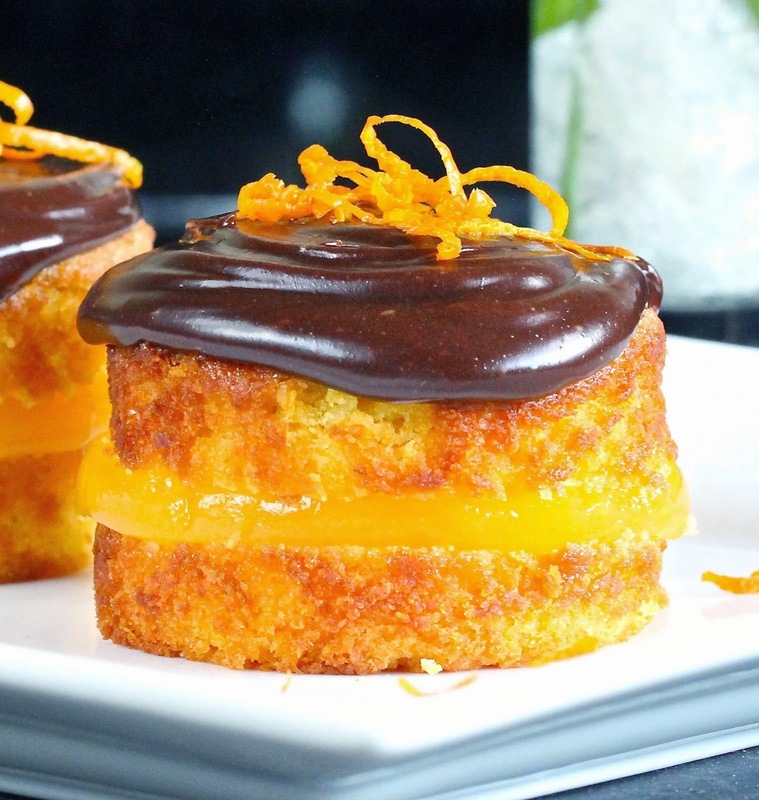 Either way these cakes look lush, tangy and a little bit boozy (thanks to some Cointreau!). My pal Lisa at United Cakedom was feeling a bit Hungary (geddit?!) making these Hungarian inspired coconut roll biscuits otherwise known as KÓKUSZTEKERCS HÁROM SZÍNBEN . 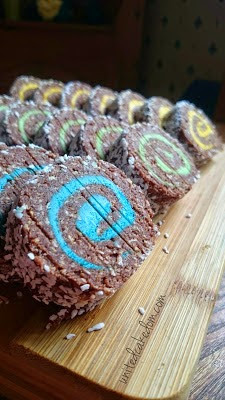 The biscuits contain digestives, desiccated coconut, almond extract, cocoa powder and elaborately coloured buttercream. These are no-bake and sound like something kids would like to make. Camilla at Fab Food 4 All had some leftover pastry and concocted these banana Nutella pinwheels. Camilla represents Denmark with these Danish pastries, but I reckon the addition of gooey Nutella could make them double for Italy too. Tasty! 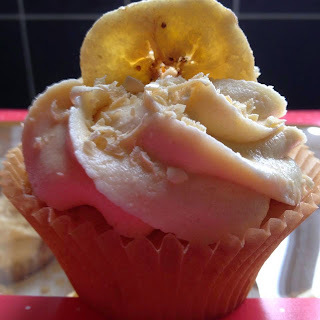 TheBaking Nana, although she doesn’t have a blog, entered two bakes – Banoffee Cupcakes (UK) and Black Forest Cupcakes (Germany) – which both look delicious I’m sure you will agree. Now, I have kept this one to last. My co-host Kat, The Baking Explorer has been exploring the country of Sweden recently and returned not long ago. Inspired by all the tempting treats she saw in Sweden, she made gluten-free cupcake versions of a Swedish Princess cake known as Prinsesstårta . She said the cake was everywhere and after returning from Stockholm, knew she had to make these. I have left these ‘til last as Kat has brought us a bake from the winning country of Sweden! ‘Congratulations’ Kat even though Treat Petite isn’t a competition! I have loved our trip through Europe and a big thanks to all who took part. Roll on Eurovision 2016! 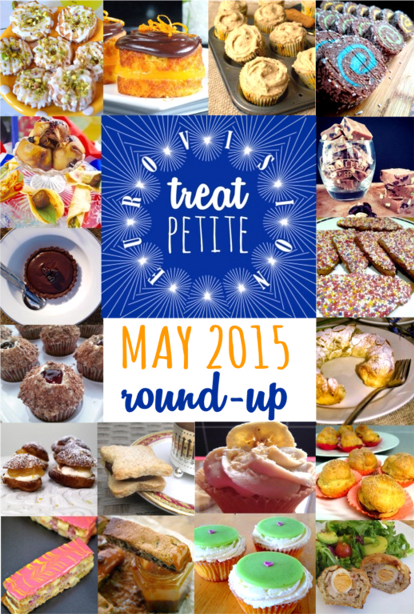 Keep an eye on The Baking Explorer for next month’s Treat Petite. 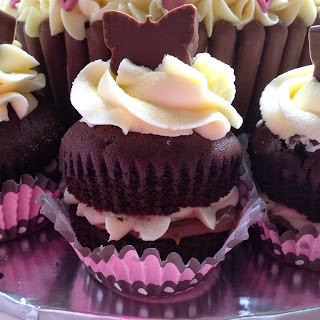 Brilliant round up, beautiful cakies! So many fantastic Eurovision entries, this would be one sensational party! Thanks for hosting, may we congratulate you on a fabulous show! A stunning selection of treats! an excellent round-up and a gorgeous collection of goodies! Fantastic round up Stuart. LOVE the variety of treats...... And love the photo montage at the top too!!! Brilliant theme and round-up, made me laugh. Also made my mouth water. 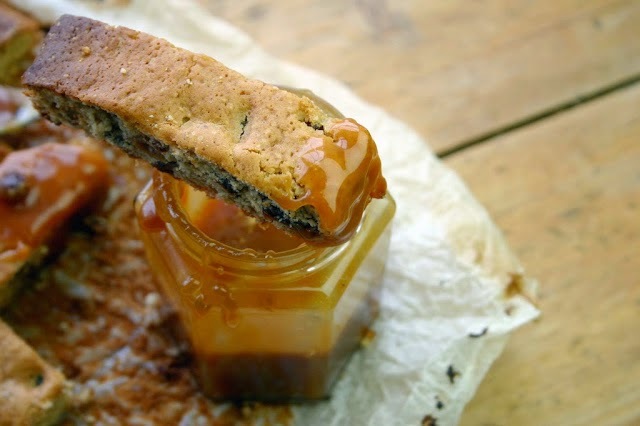 Win a 'Hot Cookie' - To Keep Your Cuppa Warm! Win a Year's Subscription to Delicious Magazine!